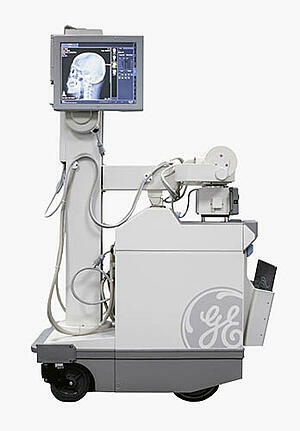 If you've been on the imaging side of healthcare for any amount of time, then you’re probably familiar with the GE AMX4 Mobile X Ray. While it’s still one of the most reliable, economical and popular Mobile X Ray systems in use today, most are operating in their native analog state leveraging outdated image processing technology. While some providers invest in new Digital Mobile X Ray systems, many elect for a more affordable pathway to transition to digital by upgrading their existing analog Mobile X Rays with DR retrofit kits. Introducing, the XDR Hybrid by Multi, Inc.
Multi, Inc. recognized the exigency and designed a wireless DR upgrade kit that transforms your legacy GE AMX4+ from an analog-based Mobile X Ray, to the latest in wireless digital technology. This upgrade boasts a dramatic improvement to patient care, workflow efficiency and throughput capability. See our video below for a detailed overview of the solution. The mast mount assembly houses the onboard Acquire PC and Charging System. It’s diverse movement capability allows for smooth and flexible rotation of the PC 270 degrees around the vertical mast of the AMX 4+. This versatility enables the technician to position the patient, shoot the X ray, and immediately see the processed images on the screen from anywhere around patient. The mast assembly offers lowering and height adjustments of the PC with up to 22 degrees of forward movement capability. This provides custom viewing angles for varying heights of the using technicians. The convenient, non-invasive charging system enables the technician to recharge the batteries of the PC with a single retractable plug. The XDR Hybrid Storage Bin was designed with the technician in mind. Everything they need in order to provide the best, most efficient care, is within arm’s reach. The bin has several key features including internal compartments for miscellaneous storage, a box of latex gloves and a bottle of disinfectant. It has an external bin which is constructed of form-fitted slots that allow for convenient storage and protection of up to (2) DR panels. This 19-inch, 2-megapixel, Medical-Grade, All-in-One, High- Resolution Touchscreen Computer features (3) internal hot-swap batteries that provide 10.5 hours of uninterrupted run time. It's HIPAA compliant and it meets all hospital network security protocols. This allows patient information to be sent over a wireless network seamlessly and securely. To prevent surface contamination, the PC bezel is factory treated with an antimicrobial additive. 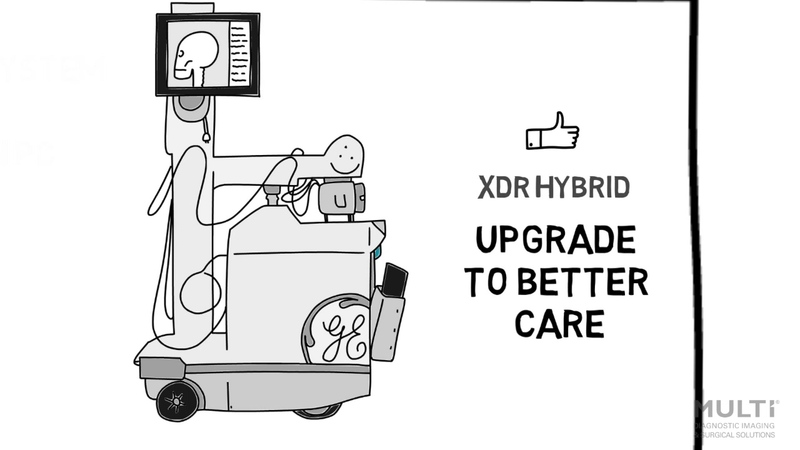 For your convenience, the XDR Hybrid integrates with any Wireless DR brand and technology. Want to learn how Multi can partner with you on your path to digital transformation? We have a dedicated team ready and eager to take your call or answer your email. Are you a dealer? Contact Multi today to inquire about our wholesale program?